The CPMR Atlantic Arc Commission’s (AAC) working groups are gathering for two days of meetings to prepare for the post-2020 period. 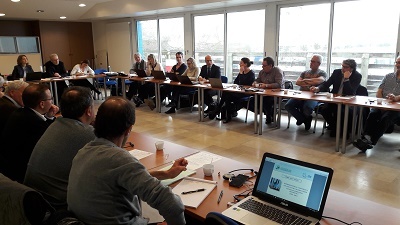 Following agreement reached at the Atlantic Arc Commission General Assembly last March, all Atlantic Arc Commission working groups will gather jointly twice a year, within the Commission’s thematic hubs. The Atlantic Arc Commission Culture and Tourism, as well as the Transport working groups, will meet on Monday 19 June. The afternoon will be dedicated to the ‘Accessibility and Attractiveness’ hub. The Atlantic Arc Commission Marine Renewable Energy, Innovation and Fisheries working groups will gather on Tuesday, 20 June within the new hub relating to maritime affairs. The Atlantic Arc Commission Atlantic Strategy working group as well as the Brexit and the Transatlantic Task Forces will have their meeting on the afternoon of Tuesday, 20 June. Numerous themes will be tackled. The accessibility/attractiveness hub will mainly deal with the contribution of the Atlantic regions to the revision of the CEF and their potential actions to enhance the visibility of the Atlantic as a touristic destination. The Maritime hub will tackle the challenges relating to the development of marine renewable energy, the Atlantic regions’ contribution to the EU Skills Agenda, the creation of a common charter to protect the Atlantic coastal environment as well as the regions’ feedback concerning the implementation of the European Maritime & Fishery Fund (EMFF). The Atlantic Strategy and Task Forces will also focus on the mid-term review of the Atlantic Strategy Action Plan, the development of its international dimension and the Atlantic Arc Commission position on Brexit. For each topic, guest speakers have been invited, including representatives of the European Parliament, the European Commission, the Atlantic States, the maritime industries, academics and associations, which are project leaders in the fields mentioned above. This new way of working is meant to be more strategic. Working groups will meet each semester, before the Atlantic Arc Commission General Assembly and the plenary session of the Atlantic Arc Commission which are key dates to assess their progresses. These hub meetings will also offer an opportunity to discuss transversal issues between working groups. As an example, maritime training and protection of the Atlantic environment are two cross cutting areas which will be dealt with as part of the maritime hub. Find our more information and read the agenda for the hub meetings.